it's still 1938 in London." The impulse to be comprehensive—to document, collect, draw, photograph all of something—is quixotic but also essentially human. What follows are institutions and individuals trying to get the full picture—inevitably an incomplete list. All the Buildings in New York. A book of same is out April 2.
are in NYU's Fales Collection. The Menu Collection of The New York Public Library has over 45,000 menus—originals from the 1840s to now. They've also transcribed each of them, dish by dish, so that the database is searchable. You'll note above that spaghetti is listed under Vegetables. One of the undersung treasures of the city, the New York Public Library Map Division has over 430,000 maps in its collection. As quests go, owning every title from New York Review of Books Classics is one that we endorse without hesitation. A special deal right now: 300 of their first titles at half off, which works out to $2,382.65 or about $8 a book. 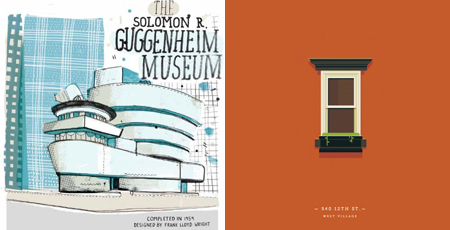 The Windows of New York: By the sound of it, not so much, by the look of it—an absolute delight from graphic designer José Guizar. Audubon's Aviary: Part I of the Complete Flock, a major watercolorfest from the New-York Historical Society, starting March 8—a 3-year series. In Park Slope, the Lesbian Herstory Archives, 484 14th St. [Prospect Pl. W./8th Ave.] is the largest collection of materials about lesbians in the world. Old York Library is a paean to New York with over 7,800 postcards, photos and maps collected by Seymour Durst, now under Columbia's care at the Avery Architectural & Fine Arts Library. The NY Philharmonic Archives are a trove that includes 520,000 pages of parts marked by Philharmonic musicians. The digital archives will eventually make 6 million documents and 7,000 hours of audio and video available online. sometimes moving celebration of us. Jason Polan, syndicated weekly on MUG, continues on his lovely mission of drawing Every Person in New York. Anthology Film Archives is home to a massive stockpile of avant-garde movies. Yivo, 15 W. 16th [5th/6th] 212.246.6080, has the world's largest collection of materials tracing Central and Eastern European Jewish history. The Municipal Archives makes 870,000 NYC images available online. Warning: major time sink ahead. The Museum of the City of New York has its own formidable collection of images. Get the full rundown on, among other things, the New York Passenger Arrival Records, 1789-1957, from The National Archives at New York City. The Schomburg Center for Research in Black Culture has an extraordinary collection of materials documenting black life, including 500,000 images of the culture and history of people of African descent. The New York Clipper was a popular 19th-century sports weekly perhaps best known for its profiles. You can get all 800+ baseball biographies in The Complete New York Clipper Baseball Biographies book. Columbia and MoMA have acquired the The Frank Lloyd Wright Foundation Archives. The University's Avery Library will be home to Wright's correspondence, 23,000 architectural drawings, and 44,000 photographs. [Photo: Frederick C. Robie residence, 1909. The New York Academy of Medicine, 1216 5th [103rd] has a wide-ranging assemblage of medical books, documents and ephemera, including pharmaceutical trade cards. The Reading Room is currently undergoing a renovation and is expected to reopen on June 1. NY Public Radio Archives has 50,000 audio recordings of NYC over the airwaves. John M. Mossman Lock Collection at The General Society of Mechanics and Tradesmen, 20 W. 44th [5th/6th] 212.840.1840, has over 370 bank and vault locks, keys, and tools from 4,000 B.C. to the present, one of the most extensive such collections in the world. $10 admission. Good ones we missed? Let us know in the comments section of our blog.